Female body shapes& body types- what are they? Your body shape is based on the size of your physical features and their relation to each other on your body, while your body type determines your body’s ability to gain fat and muscle. In addition, certain exercise types are more effective if you’re a particular body shape or body type. Apple shape: These women have broad(er) shoulders compared to their (narrower) hips.Apple shaped women tend to have slim legs/thighs, while the abdomen and chest look out of proportion compared to the rest of the body. Fat is mainly distributed in the abdomen, chest, and face. Ruler shape: the waist measurement is less than 9 inches smaller than the hips or bust measurement. Body fat is distributed predominantly in the abdomen, buttocks, chest, and face. This overall fat distribution creates the typical ruler (straight) shape. Pear shape: The hip measurement is greater than the bust measurement. The distribution of fat varies, with fat tending to deposit first in the buttocks, hips, and thighs. As body fat percentage increases, an increasing proportion of body fat is distributed around the waist and upper abdomen. The women of this body type tend to have a (relatively) larger rear, robust thighs, and a small(er) bosom. Hourglass shape: The hip and bust are almost of equal size with a narrow waist. Body fat distribution tends to be around both the upper body and lower body. This body type enlarges the arms, chest, hips, and rear before other parts, such as the waist and upper abdomen. An Ectomorph has the body type that is most often seen in the pages of fashion magazines. They are slim boned, long limbed, lithe and have very little body fat and little muscle. Ectomorphs tend to have fragile, delicately built bodies and find it difficult to gain weight or add muscle. Supermodels, ballerinas and basketball players most commonly fall into this group. Although ectomorphs tend to be highly regarded, one must remember that they have problems of their own. Ectomorphs tend to lack shape because of their low muscle mass. Female ectomorphs are likely to be flat chested and may complain of looking boyish, wishing they had more womanly curves. Male ectomorphs struggle to increase their muscle mass and may look wiry. As you see, they too, have to work hard to achieve their goals. As ectomorphs lack muscle mass, thus they need to keep their weight lower than endomorphs or mesomorphs. Furthermore, some ectomorph want and struggle to gain weight – muscle and some fat. ~Being a female ectomorph is currently in vogue. Ectomorphs, tend to lack both muscle and fat. However, it is not impossible to overcome your lack of muscle mass. It requires a serious focus on mass building through diet and weight training. The good news is that you have a naturally low body fat percentage. Thus, with even little gains in muscle you are able to boast excellent muscle definition. Female ectomorphs may want to gain mass to add shape. ~Female mesomorphs, that includes women who feel they have become too bulky, should do light-to-moderate weight training, no more than 3 times a week for muscle shaping and sculpting. This will help enhance tone and not increase size. Do 2 to 3 sets of 12 – 15 repetitions using light to moderate weights for each major muscle group. Try circuit training, which encourages strength and stamina, but without building bulk. Be careful when choosing thigh exercisesin a bid to slim down thighs. Endomorphs have a soft, curvy and round physique and display the opposite characteristics from ectomorphs. They have a sluggish metabolism, gain weight easily and have to work hard to lose body fat. Endomorphs often have a larger frame and tend to have wider hips than shoulders, creating a pear-shaped physique. Some of the sexiest and most beautiful singers and actresses are endomorphs. Similarly, many of the actors and action heroes on the silver screen are endomorphs. There is no way round this issue. Endomorphs will have a harder time losing weight. But lets be clear. No one is saying that endomorphs CAN’T lose weight, but that they will have to work harder to lose the weight. Endomorphs do not have to be overweight. They simply require more determination than perhaps a mesomorph would, to achieve the same goal. Endomorphs have to train hard and must eat healthily most of the time. Endomorphs gain fat quickly when eating the wrong types of foods because their metabolism can be unforgiving. The good news is that endomorph women are often thought of as voluptuous and sensual because they go in at the waist, have large rounded breasts and have womanly curves in all the right places. In shape the female endomorph is unrivaled – toned and fit whilst being soft, sensuous and alluring. 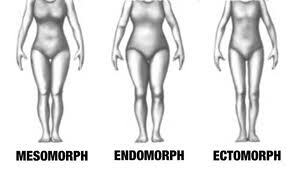 ~Endomorphs have a higher body fat percentage. Thus, as an endomorph your primary focus should be on cardiovascular exercise and fat burning. Endomorphs should either start weight training immediately or wait until you have reached a weight with which you are more happy. I really like how you have expanded from the general body shapes of hourglass, apple and pear etc and explored the endomorph, mesomorph and ectomorph and explained clearly what they are and the problems that can occur when trying to loose weight. This was really interesting, great post. Thank You, Keep in touch..
You made it sound like hourglass figured women are mesomorphs and pear shaped women are endomorphs…From personal experience, I can tell you that hourglass figured women can be endomorphs too… most of the curvy ladies are soft and lack much muscle tone, but have amazing figures.